Discussion in 'Introduce Yourself' started by ChrisHGT, Oct 7, 2013. My name is Chris and I'm 21. I started to notice sounds in my left year in 2008. Back then I could barely hear it in a silent room. A year later I went to a concert and my ears rung really bad after. A few days later it grew fainter but I could hear it very well in both ears, slighty louder in my left, at night or when wearing enclosed headphones. It didn't bother me at all, but I noticed that sometimes I would have trouble following conversation in loud environments like a restaurant. I should add that at this point the t sounded like whitenoise and a high pitched ringing. In March of this year the volume increased after watching a movie with enclosed headphones. Still nothing I couldn't handle. After this incident I swore to never use headphones and go near loud noise again. Unfortunately, I went to a night club in June and it totally destroyed my ears (yes I know it's a stupid thing to do. Let's just say that alcohol and peer pressure makes it difficult to say no). Now the ringing is extremely loud compared to before. I can now hear it 24/7 and it's driving me insane. It has taken over my life. In addition I got a hearing loss (although my audiogram was in the normal range). I now have difficulty hearing what's being said on TV and in movies and can't hear people talking in the next room. Furthermore music sounds totally different and my ears will ache, feel full and warm after long sessions of listening on moderat volume (speakers). Then there's the sound sensitivity. Clapping, clinging of silverware and loud music are like knives stabbing in my head. Going to the movies is now like walking straight into hell. My friends and family don't seem to understand what I'm going through. They keep talking with soft voices, playing loud music and call me a wuss if I complain about it. I'm literally terrified of loud sounds now and it's affecting my social life. Being told that my ears look completely normal doesn't help my situation at all. The feeling of helplessness is awful. I would say that my quality of life has been reduced by as much as 70%. Thinking about my t and hearing loss every day is all but depressing. Hello Chris, sorry to hear about your T , do go through other posts, lots of information on this forum. Try to eat healthy and take some supplements for the ears like zinc , niacin, don't drink sodas, caffeine and reduce sodium intake. Hope you are getting enough sleep, if not try taking magnesium and camomile tea before bedtime. Hope u feel better soon. Hi Chris, Sherri gave some good advice. As for you family & friends not getting it, have them read support section here. Perhaps they will get a better idea of what you are going through and will give you some support. I am sure you have seen an ENT. If not make an appointment. I see you joined TT in 2008 A lot of research has been done since 2008 browse around and have a look. Yes I visited an ENT. My audiogram was within the normal range. No conductive hearing loss either. I felt that I struggled a bit with the word recognition, like the difference with v and b, m and n and so on. The ENT was not interested in hearing my story, he just did the tests and that was it. He even implied that I should see a psychologist, like he didn't believe me! My GP referred me to a neurologist, though. Don't know what they'll be able to do. Has anyone on here gone to see a neurologist? If so, what kind of tests did they run? I was told to see a neurologist to rule out a brain/ear tumor. She said there were no tumors and I did not need to see her anymore. That was my experience with a neurologist. Right now I am seeing my ENT every three months and got a combo hearing aid/masker. I does help when the noise gets really high, I would rather hear white or pink noise versus the T noise. I can set it to white or pink noise. I'm pretty sure it's noise induced and no tumor involved as the T and hearing got worse right after the incidents. When I play this "hearing test"
I start hearing a sound at around 15kHz using laptop speakers. As it goes down it's like the tones are switching from ear to ear. Shouldn't it be constant in both ears? Something I forgot to tell about is that sometimes it's like my hearing goes out and I get a high pitched tone different from the one's I've got. Last a few seconds. Does this mean that hair cells are damaged and sometimes bend completely creating a tone? 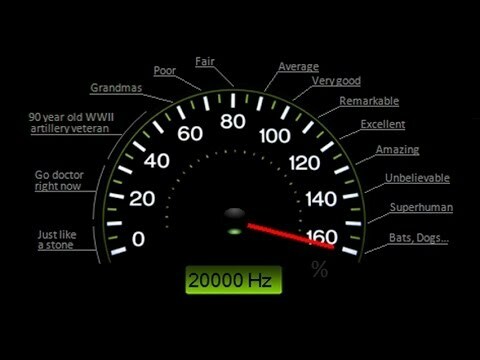 Most online hearing tests are flawed due to a number of factors, that youtube video only goes up to 480p which means that audio has definitely been compressed (compression usually results in high frequencies being diminished/muddled, similar to how mp3s work) so they aren't really an accurate way to test your hearing. There's also the factor of the sort of equipment you have available to test your hearing, speakers usually do not give you a "flat" frequency response and you often get boosted in some frequencies and then cut offs higher up in the frequency range. Best way to get a good idea of what your hearing is like to get your audiometry results handy, and also see if you can find somewhere where they would be willing to test your higher frequency range (most ENTs and Audiologists will only bother to test up to 8khz, high frequency testing will test your hearing up to 20khz). Do you remember if you had any dips in your hearing test? That's common and will happen to people without tinnitus also. Hope you start to feel better! My tinnitus has also gotten quite a bit worse over the past few months due to a few things, struggling but trying to stay positive at the moment! He didn't show it to me. I did see that there was a 5/10 db (don't know if they test in 5 or 10 incrememts) drop at the lowest frequency however. My problem is that the words will sometimes go together and whispers sounds like jibberish at times. Sounds I seem to miss are T, L, K, Z, and H. I will post an update on the sounds as I haven't paid to o much attention to what's missing. I can hear the rustling of leaves, rain, birds, the fridge, fans, clock ticking in the next room with doors closed, sounds from electrical equipment etc. One thing I have noticed is that I can't hear my cats purr unless I'm right next to them or put my head on their belly. Apart from that my hearing has got to be perfect, right? Sadly that's not the case. For instance when my friends talk to each other from across the room I can't understand what the person furthest away is saying. Yet they have no trouble! Moreover, I used to be able to hear what people in the next room were saying. Now it's just humming voices. So annoying! Let's not forget the TV which I previously had no trouble with. Today I need to be fully focused on it and still I miss out on a lot. The tiniest sound from somewhere else in the room can make me miss what's being said. Back to the ENT. After the appoimtmemt I was dissapointed and angry because they couldn't find anything and didn't seem to care at all! The next appoimtment I will demand to see my audiogram so I can post it here. I will also ask if they can test more frequencies. Always a good idea to get copies of all tests, even blood tests. I have been doing this for years. It helps if you have your results ready when seeing another Dr. Try to keep all your medical tests & Dr's. in one place. A 5-15db loss isn't considered significant by ENT's and audiologists apparently. My opinion differs because I still think that 5-10db does make a difference with hearing but the reasoning I was given that many people will experience dips of that range in their hearing as they age and many people will often experience variations of 5-10dbs on any given day. This has actually happened to me, I've had about 5 hearing tests, some showed losses of 10db at multiple frequencies, and then the others showed they were normal - so it's all quite tricky and annoying! Did you happen you have a speech audiometry? This is where they test your ability to be able understand and comprehend speech, if you haven't had it done, get it done! Get a copy of your results and keep them handy, if your current ENT isn't being helpful, then seek the help of another one! If you're keen on getting your high frequency hearing testing, I would recommend you call multiple audiologists in your area and ask if they have the capability to test up to 20khz or know of somewhere that does, many ENTs/audiologists only have equipment that will test to 8khz so you might have to hunt a bit! I found a place in one of the bigger hospitals here. Good luck buddy, hope things start to take a turn for the better! Another weird thing is when I pinch my nose and blow I can hear my heart beat and my voice (like putting your fingers in the ears and talk) in my right ear. Why not the other ear? I've had the feeling of fullness for 4 months so I do this a lot. Now I am a 100% certain I have a hearing loss, even if my numbers are within the normal range. When watching movies and tv shows I can't understand whispers/soft speech. With the whispers I hear certain sounds but nothing that makes sense. Sometimes I wouldn't even know they said something unless I watch their lips or read the subtitles. With that said, I could hear (and understand) it when putting my ears right next to the speakers. Soft speech is like mumbling. I know what language the person is speaking but the words run together. Would hearing aids benefit me at all? I went to an ice hockey game this past weekend and noticed that the loud sounds didn't bother me as much as before. However the clapping was paintful at times. Another thing is that the T is not bothering me compared to my hearing loss. As I am an avid language learner it makes things much more difficult. With a normal audiogram I fear that I don't have any options I would hate to give up learning more languages. Hey Guys, If You're Struggling with the Usual Masking Sounds for Sleep, Crickets Might Be Good!